It seems just about every health expert is touting the wonderful benefits of adding olive oil to your diet. But navigating the minefield of choices in the grocery aisle or on line can be a mystifying experience. You’ll find “100%” Something over here and “Pure” Something Else over there. There’s “Refined” this and “Light” that. 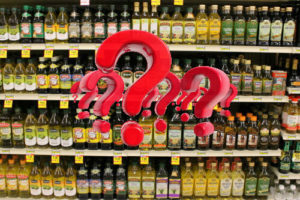 On what basis should a health-conscious shopper select their olive oil? International Olive Council (IOC) . It sure sounds like it should be top-shelf, but it’s actually one of the lower grades on the Olive Oil scale. As the name implies, Pure Olive Oil has been processed to remove defects, which would otherwise make it unsafe for humans to eat. For Refined Olive Oil to have the word “Pure” on the label, an unspecified amount of virgin oil must be added. Pure Refined Olive Oil has about 3% acid content. More acid and less flavor. It’s also usually paler than EVOO. A sub-category of Pure Olive oil is “Light Olive Oil”. Don’t assume that’s better or low-calorie. It’s not a diet product. The only things it’s light on are color and flavor, which have been processed out. 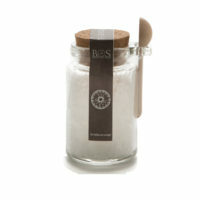 This is a medium-grade oil obtained from olives without any refinement or undergoing any other treatment. While a slight improvement over Pure Refined Olive Oil, this oil still has taste defects that some will notice. Virgin Olive Oil will have reasonably good aroma and flavor. Acidity must not exceed 2%. This brings us to the champion of this fruit juice contest. That’s right. Olives are fruit. So think of Extra Virgin Olive Oil as freshly pressed juice. The olives are crushed at a mill and the oil is extracted mechanically-versus refined oil, which requires heat and or chemicals. The juice is ground into a paste then run through a centrifuge to separate the oil from any water and solids. Whoa, Nelly. That’s not the half of it. To earn that Extra Virgin Olive Oil label it must pass a battery of tests assessing the acidity be below 0.8%. Standards set by the International Olive Council are strictly enforced to ensure EVOO’s purity. But wait! There’s More! Now the Oil has to pass the muster of a panel of professional tasters who sniff out any flaws in flavor. This is all done to ensure that when you pour out some EVOO, you’re going to have a true olive taste. Plus, your EVOO will have the maximum amount of anti-oxidants and anti-inflammatory benefits, signified by it’s distinctive darker green color and peppery finish. There is one and only one type of Olive Oil that the experts agree offers the most health benefits: Extra Virgin Olive Oil. When you hear about the benefits of a Mediterranean Diet and why it has become so popular, it’s Extra-Virgin Olive Oil that is such a key ingredient. 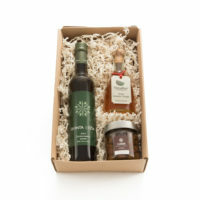 All of this “Extra” scrutiny for Extra Virgin Olive Oil, coupled with vastly superior flavor and health benefits more than justifies EVOO’s higher price point. Caveat Emptor: There is plenty of fraud in the Olive Oil Biz. Some Oils labeled Extra Virgin are actually diluted with refined oils. Read the label carefully. We at Marvalhas are proud to offer only the finest Extra Virgin Olive Oils, which have met the rigorous certification requirements. When you buy from us, you’ll know you’ve chosen the best. Better yet-you’ll TASTE the difference.